By THOMAS F. WILLFORD in April 1954. SCARCELY a month goes by without one reading of a venerable old home, no longer tenanted, and shorn of the revenues which for so long maintained it, standing forlorn and silent, awaiting an inglorious end. There must be many such buildings up and down the land, but usually it is to the larger and more stately houses that publicity is given. Many of the smaller manors and halls in the country, possessing little or no architectural value but rich in historic associations, are also silently passing away without the requiem of the Press, and there are few to mourn their passing. Such is the passing of Marple Hall in the north-east corner of Cheshire. Partly rebuilt during the seventeenth century and replacing an earlier half timberered structure, its red sandstone walls and mullioned windows stand amid the weeds and rank growth now covering the gardens, lawns and stable yard. The interior presents an even more depressing picture of decay and destruction, for a falling chimney stack, having torn its way through roof and floors, lies scattered in its own debris at the foot of the oak staircase - the epitome of desolation. Here lived the family of Bradshaw and Bradshaw-Isherwood, and at Marple Hall was born in 1602 John Bradshaw, President of the High Court of Justice, whom fate decreed should pass sentence of death on Charles I. Such thoughts passed through my mind on a day recently as I rested for a moment from the depressing task of removing the old stained glass windows, some of which had been presented to the family by a former Lady Newton of Lyme. The entrance hall - viewed from opposite ends - in the late 1920's and to-day. "... a falling chimney stack, having torn its way through roof and floors, lies scattered in its own debris at the foot of the oak staircase, and half fills the entrance hall"
Half of this glass is of continental origin either Germano-Swiss or the Low Countries, all biblical subjects of late renaissance craftmanship, but there are a few pieces of English work, a portrait of John Milton - related to the family - the arms and Crest of the Leighs of Lyme and a portrait of a lady in fathingale and ruff. It is the mother of John Bradshaw. Which all the world will wonder at. Opposite the entry of his birth in the register of the Parish Church of Stockport, is written the word "Traitor". A small piece of this nation's history perhaps, but as I stood in the semi-darkness even the elements appeared to be roaring in mad accompaniment, for a gale force wind was tearing the branches from the beech trees in the park close by and tumbling yet more debris down the hole in the roof. 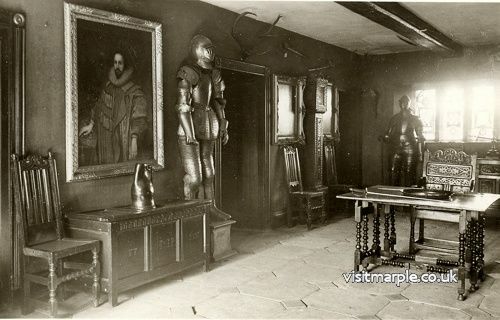 From somewhere above came the sound of knocking and infrequent sawing as two men who, like myself, were engaged upon work of salvage removed a section of oak panelling together with a complete fireplace and overmantle, bearing the high relief of the family arms. I understand this is to be re-erected in the Grosvenor Museum of Chester. High up on the wall of the main staircase hung an old portrait, the only one now left, and if the light permitted one could see a middle aged woman of dour visage in eighteenth century dress and holding a small dog. She it is who, according to tradition, haunts the second floor bedroom on the east corner at the rear. Ill luck awaits whoever removes the portrait, and so "Moll of Brabyns" continues to stare gloomily down the wrecked staircase. It is said she greatly resented children sleeping in the room. If there be any truth in the legend, then her nocturnal beat is ended and "Moll" can rest in peace at last. Since writing the above I hear the portrait has been removed. The wind and rain are not responsible alone for such chaos, for the work of the vandal can be seen wherever one looks. The large stone sundial at the front has been toppled down the steps on which it stood in the centre of the lower lawn. "...its red sandstone walls and mullioned windows stand amid the weeds and rank growth..."
Even the audacity of bringing along saws to facilitate the pilfering of timber is not lacking, and the shattered glass in most of the leaded windows is all the evience needed, if any, to prove the vicious spirit in the modern vandal. With the glass packed and stored on the Chester lorry, it was a relief to turn my back and pass through the inner gate out into the park. Article reproduced with the permission of Cheshire Life Magazine.